HARADASUN (AUS) (Bay 2003-Stud 2008). 7 wins-1 at 2, AJC Doncaster H., Gr.1. Sire of 232 rnrs, 127 wnrs, inc. SW Harry's Son (Greyville Premier's Champion S., Gr.1), Respondent, Kabayan, Taiyoo, Royal Rada, Tukiyo, SP Modoc, Prince Harada, Follow My Dust, Famechon, Sanosuke, Goluana and of Airlie Sun, Divine Service, My Shabella, Libidosun - Otouto (H.K. ), Taillevent, Gherardini, Haradafull, Kanji, King River, Nozawa, Redasun, The Ultimatum, etc. Taillevent (g. by Haradasun). 2 wins. See below. DUTCHY'S LASS (Dutch Harry). 3 wins. See above. Bold Sequalo - Mega Form (Mac.). 11 wins-2 at 2-to 1400m in Aust. and Macau, QTC Brisbane Self Storage 2YO H., 3d BTC Yalumba 2YO H.
Paint the Scene. 5 wins to 1400m, MVRC BMW Sprint H., 3d VRC Sobar H.
Hopes 'n' Dreams. 11 wins-1 at 2-to 1400m, 2d MVRC BMW Melbourne H., Bar Landy H., 3d MVRC Jockey Bar H., VATC Festival Supermarkets H., QTC True Version H.
Brookman. 7 wins-1 at 2-from 1000m to 1600m in Aust. Ruby d'Or. Placed at 3 in Aust. Bank Fee. Winner at 800m in Aust. Zvornik Lass. 3 wins. See above. Kite Templar. Placed in Aust. Orlanta Blush. Placed in Aust. Linepack. 4 wins from 1000m to 1600m in Aust. Mr Genuine. 7 wins to 1250m in Aust. Innocent's Sister. 2 wins at 1000m in Aust. Big Irons. 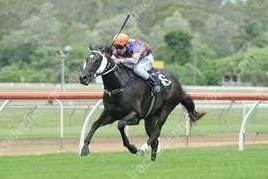 Winner at 1600m in Aust. Yallah Breeze. 9 wins to 1200m, A$130,165, AJC CW Cropper H., Endeavour H., STC Young Members H., 2d AJC Paddington H., STC Ultimo H., 4th STC Missile S., Gr.3. Orchid Street - O' Shiny (H.K.). Winner at 1400m, HKJC Wo Che H., 2d HKJC Tung Tau H.
Miss Pinkalot. 2 wins at 1000m, 1300m, 2d SAJC Boxing Day at ASPM H.
Hatton Garden. Winner at 1000m in Aust. Vaudeville Lass. Winner. See above. Epsom Haige. Winner at 1650m, 3d BTC Napoleon 2YO H.
Shadows of Silver. 4 wins from 1350m to 1600m in Aust. Beejay's Gold. 2 wins at 900m, 1200m in Aust. Captain Blueblood. Winner at 1000m in Aust. Race Record: 8 Starts 2-1-0 A$42,400. 2 wins at 2 in 2014-15, BRC Novotel Brisbane Airport H., Ipswich TC Sirromet Wines 2YO P.